Spring is here, and you may be considering renovations for your home. Some homeowners may be making modest changes. New plants for your yard, a fresh flower bed, or a newly-planted garden are all great ways to update your yard. Other homeowners may be planning something a bit grander. A new or expanded deck, fresh hardscaping, or even a new pool may be in your near future. Whatever your plans, now’s the time to enjoy prepping your home and yard for warmer weather. But have you considered mosquito control? If you haven’t thought about how you will deal with the mosquitoes in your yard this season, now is the time to start. 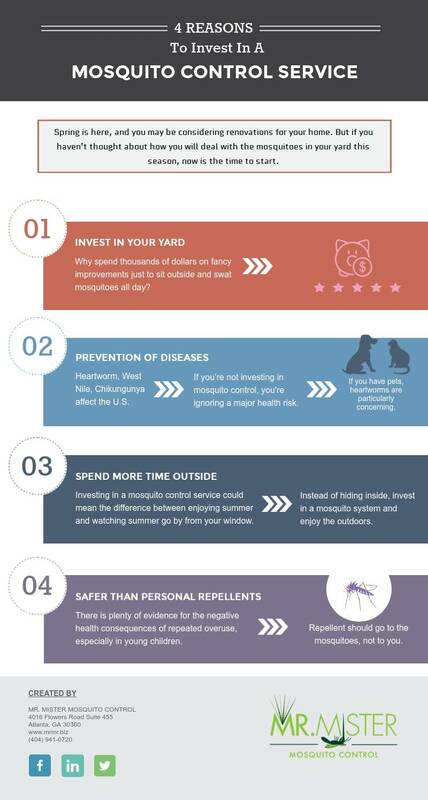 Here are four reasons to invest in a mosquito service. Mosquito control is on backyard investment with a huge return on investment. For less than the cost of some minor landscaping, your yard could be free from flies, gnats, wasps, ticks, fleas, spiders, and, of course, mosquitoes. Mr. Mister offers some of the most competitive rates in the Atlanta area and service that beats all of our competitors. There is simply no reason to put up with pests in your yard this spring and summer. Why spend thousands of dollars on fancy improvements just to sit outside and swat mosquitoes all day? If you’re going to make any investment in your yard this season, large or small, you need to include mosquito control. Leaving it out means that all of your hard work on your other investments is less enjoyable than it could be. Heartworm, West Nile, and Chikungunya are all mosquito-transmitted diseases that pose a threat in the U.S. Thankfully, we are spared some of the worst diseases, such as Malaria, but the diseases that mosquitoes carry in the U.S. are no laughing matter. Keeping people and pets safe from mosquito-borne illnesses is the responsible thing to do for your family’s safety. You can’t put a price on peace of mind but investing in mosquito control also makes sense financially. Mosquito control is simply cheaper than treating diseases. Consider the amount of energy we put into protecting our own health and the health of our loved ones. We eat right, go to the doctor, pay for gym memberships, sports activities, and exercise gear. We vaccinate our pets and make sure they are treated regularly for fleas and ticks. But if you’re not investing in mosquito control, you are missing a significant health benefit. If you have pets, heartworms are a particularly concerning mosquito-borne disease. Heartworms are common in wild animals, from stray dogs to coyotes. When a mosquito bites an animal with heartworms, it can collect heartworm larvae. Then, when it lands on your furry friend, it deposits those larvae. Once in your dog’s system, the larvae grow and proliferate, posing a serious and even life-threatening health risk. By keeping mosquitoes out of your yard, you are saving your pets from a truly terrible disease. You have a yard, and you should enjoy it! As the weather turns warmer, you can use your backyard for playing, swimming, grilling, or even just quietly reading a book. But warmer weather means more pests, which means more bites. We’ve heard from many homeowners who say that the constant onslaught of mosquitoes and other pests has almost entirely prevented them from using their outdoor spaces. We think that’s a shame and a wholly preventable problem. Investing in a mosquito control service could mean the difference between enjoying summer and watching summer go by from your window. Instead of hiding inside, invest in a mosquito system and enjoy the outdoors. Our products consist of mostly water, are 100% biodegradable, and are safe for children and pets. And once the spray is applied to the foliage around your yard, you have little chance of coming into direct contact with it. That’s a huge health advantage over personal repellents. Everyone is familiar with the unpleasant odor and greasy feel of the most common DEET-based mosquito repellents. And while many studies have shown DEET to be relatively safe, there is plenty of evidence for the negative health consequences of repeated overuse, especially in young children. And repellents only work when you apply them regularly, even multiple times over the course of a day. If you want to stay mosquito-free as you enjoy your backyard, personal mosquito repellents should never be your mosquito control method of choice. When you invest in a mosquito control service from Mr. Mister, we will treat your yard so that the repellent goes to the mosquitoes, not to you. Instead of feeling smelly and greasy, you can stay as you are, enjoying a yard that is free of mosquitoes all season long. If you are ready to invest in a mosquito control service, you are already in the right place. ClearZone™ Misting Service from Mr. Mister is the best system in the Southeast for beating mosquitoes in your yard. In fact, we guarantee that your property will be mosquito-free all season long. We’ll even come back for a complimentary treatment if you notice mosquitoes between regularly-scheduled visits. So if you’re ready to go mosquito-free, contact Mr. Mister for an instant quote today!